Argo Group, a small asset management firm that runs several emerging market funds, released the interim results for the first six months of 2012 yesterday. The share price of the company is down 28% since I bought my position in the beginning of the year, so a good moment to re-evaluate my thesis and check if maybe picking up some additional shares makes sense. Net current asset value has remained fairly constant the past years. I expect that in future years there is going to be some more variance because the company has been using cash to invest in their own emerging market funds. The company has currently 17.5M invested, mostly in “The Argo Fund”, and 5M in cash. NCAV is currently 25.8M while the market cap is just 11.3M USD: a 56% discount. It should be noted that the historical development of NCAV does not paint the complete picture with regards to value creation and destruction at Argo Group. The company spends a significant amount of money paying a dividend, has used cash to repurchase shares and there is of course a lot of variance in short term investment results. In line with last year, the Group has continued to keep its cost base under review with total costs falling to US$3.2 million (six months to 30 June 2011: US$5.2 million). Further cost savings and efficiencies have been identified including the closure of the Buenos Aires office, with investments in Latin America continuing to be covered by the Group’s investment teams operating out of its London office. The Group’s cost base will remain under constant review whilst ensuring efficient deployment of Group resources and safeguarding of the requisite infrastructure. 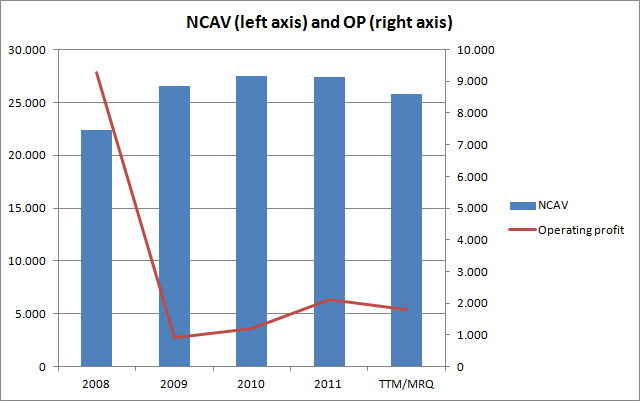 Given the profitability of Argo Group I don’t think the company deserves to trade at any discount to NCAV. NCAV consists mostly of cash and investments, and those could in theory easily be extracted from the business and returned to shareholders without really damaging the earnings potential of the company. So I actually think that the company is worth even more: cash + investments + 2.5% ~ 5% of AUM seems to be a more reasonable estimate (this would imply a valuation between 30.1M and 37.7M). The company stopped buying back shares this year (negative development, especially given the depressed share price today). The company increased it’s dividend from 1.2p per share to 1.3p per share (positive development, and giving Argo currently a 12.3% yield). Some funds were restructured and a new fund with 107.8M of AUM was formed in the beginning of this year, also resetting the high-water mark. A positive development: just look at the earnings in 2008 to see what an impact performance fees can have. I don’t think that the intrinsic value of Argo Group has changed a lot between the beginning of the year and now: a cheap company lost a little bit of value and became even cheaper in the process. I’m going to try if I can pick-up some additional shares. This entry was posted in Portfolio and tagged ARGO.L on August 30, 2012 by Alpha Vulture. Hi, Do you know what the high water marks are for each fund and their current NAV? Surprised I couldn’t find that info in the annual report. You can find the current NAV of each fund in every report, and they are indeed not telling a lot about the high water marks. Currently they have ~300M in AUM, and ~100M is close to the high water mark (the new fund) and the other 200M is significant below the high water mark. In the management commentary in the 2009 annual report the company disclosed that their main fund needed to gain 50% before reaching the high water mark. It gained a bit since then, but still a long way to go. Have you seen the post 81 on this thread on advfn by paperwerks? (I know most posts on that site are nonsense, but this one seems sensible). It says that the case against Florian Homm is still very much a live issue, and that a new ruling means that litigants could potentially refile a suit against ARGO. I don’t know whether his conclusion about this is correct or not but reading thiat post was enough to dissuade me from buying ARGO which I had been considering doing on the back of the price weakness in July. Nope, didn’t see that. Thought that the legal problems were gone after the case was closed last year. Certainly something to think about. I’m not a lawyer so hard/impossible to handicap the risk of a new lawsuit. Maybe this is why they pay out a big dividend? That’s certainly money that cannot be recoverd. A subsidiary from Argo Real Estate defaulted and AREOF delisted due to a debt restructuring: http://www.argocapitalproperty.com/media/documents/areof_de_listing_statement.pdf . Probably not good news for a) the equity holdings and b) the receivables from AREOF on the ARGO balance sheet. Annual report is slightly later this year, expected in may. Developments could’ve been better. Yeah, obviously not great news, but not a disaster either. Argo has a limited amount of money in the real estate fund.